Ted Cruz, long reluctant to directly criticize Donald Trump, threw caution to the wind Saturday as he ripped his Republican presidential opponent as a fake conservative. FORT MILL, S.C. — Ted Cruz, long reluctant to directly criticize Donald Trump, threw caution to the wind Saturday as he ripped his Republican presidential opponent as a fake conservative. "Donald’s record does not match what he says as a candidate," told reporters before a national security forum here at a church, delivering an assessment of the onetime ally in the race that would have been unthinkable as recently as last week. "I recognize what Donald says on the campaign trail today is fairly conservative, but voters are discerning." Cruz went on to respond to a series of critical tweets earlier Saturday morning from Trump by questioning his judgment and temperament to be president. The senator suggested Trump's tweets were caused by a new poll that show him beating the survey-obsessed billionaire in a head-to-head match-up. "That has got to drive him nuts, and I imagine it sent him out of bed this morning tweeting and tweeting and tweeting," Cruz said. "I think in terms of a commander in chief, we ought to have someone who isn’t springing out of bed to tweet in a frantic response to the latest polls." "I think the American people is looking for a commander in chief who is stable and steady and a calm hand to keep this country safe," Cruz added. Cruz also wondered aloud why Trump had reacted angrily to comments Cruz made a day earlier blasting the policies of New York Democrats. The two candidates have been tangled over Cruz's use of the phrase "New York values." “It does raise the question of, 'OK, if you are offended at my pointing out how much the failed policies of Hillary Clinton and Andrew Cuomo and Bill de Blasio have hurt New Yorkers, then which of those policies do you agree with?" Cruz said. "Given the fact that for much of his life, Donald was financially supporting those politicians, writing checks to Hillary Clinton, writing checks to Andrew Cuomo, it’s a fair inference that he supports their policies." Cruz added he was especially surprised that Trump would object to the idea of "New York values" because "he's the one who laid out this analysis" in a 1999 TV interview. In the interview with Tim Russert, Trump repeatedly attributed his liberal stands on some issues to the fact he is from the solidly Democratic Empire State. Cruz continued to sketch a number of other contrasts with Trump, bringing up gun and property rights when pressed to detail policy differences with the billionaire. Asked to say where he differs with Trump on national security, Cruz flatly replied, "To be honest, I don't know what Trump's position is." Cruz's remarks to reporters in Fort Mill represented the sharpest escalation yet in his rhetoric against Trump after months of refusing to attack the billionaire. Asked why he was now raising the Tim Russert interview, for example, Cruz suggested it all began with Trump's questioning of his eligibility to be president due to his Canadian birth. “Well, it came up initially in response to Donald playing 'Born in the USA' in his rallies," Cruz said. "I made a quip that perhaps he ought to play 'New York, New York,' and Donald got very upset with that." 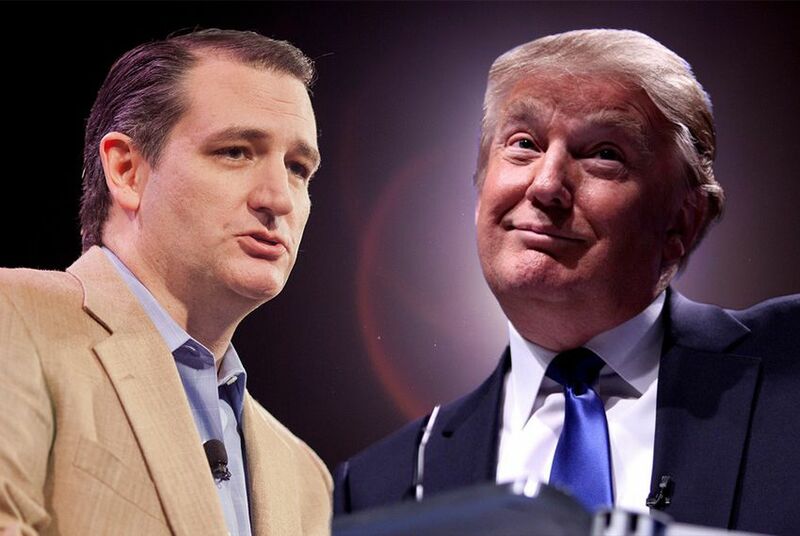 Cruz and Trump were set to cross paths later Saturday in Myrtle Beach, where they are both set to speak in the afternoon at a tea party convention.